It is 9.30 am. The M block main park in Sundarnagri in New Delhi is gearing up for a meeting. Two men carry a microphone and speaker into it. While they fix the gadgets into place, two men enter on a bike, with a bag of rugs intended for seating people on the ground. In one corner of the park, Santosh, a member of Parivartan, a non-profit in New Delhi, is giving a batch of people a few instructions. Santosh Kumar, the councillor of the ward rushes in at this moment. He has a word with the members of Parivartan and starts making frantic phone calls to the government officials who are yet to arrive. People have started gathering in the park. Mohalla Sabha is about to begin. There are the usual failed attempts by activists to ask people to settle down. Some listen, others continue to chatter. Amidst the confusion, Parivartan’s volunteers approach the audience with chits of paper on which they write down the problems they came to the sabha to discuss. The government officials arrive soon and the sabha begins at 11 am, an hour later than the scheduled time. Rajesh Kumar, a Parivartan member, takes the microphone and reads aloud the first chit. It is by Naeema Parveen. “The park is very dirty and it turns into a gambling ground in the evening. Children cannot play here, women cannot pass through without being subjected to lewd comments,” fumes Parveen. Rajesh looks enquiringly at the councillor, Santosh Kumar, who asks Mahipal Singh, head constable of the area to answer. “I will look into the problem and take necessary steps to stop the gambling,” said Singh. Pratap Singh, a representative from the horticulture department, is called to explain the unattended park. “I agree the park has been neglected. I have appointed a gardener who will come to work here regularly,” assures Singh. But these are mere assurances; the crowd is restless, making it difficult for the organizers to continue with the meeting. The attempts to settle them down are on once again, “Agar aap aise hi karte rahenge to sabha nahin ho paegi (If you go on this way, we will not be able to conduct the meeting),” says Santosh. The next chit is from Mohammad Kureshi. He turns out to be a 10-yearold boy, appropriately dressed for the occasion in a black kurta: “The road in front of my house is completely broken and all the nullahs are choked. I cannot call my friends home.” Everybody claps and K K Sharma, assistant engineer in the public works department, is called to answer. He notes down the gali number and promises to get it repaired as soon as possible. More complaints ranging from waste strewn all around to high electricity and water bills are raised in the meeting. Chaos reigns once again and before they know, it is time for the block visit. The councillor takes the mike one last time and promises to go through all the unread complaints. During the block visit, sabha members set out to survey every lane of M block. Officials are shown the unattended garbage, broken lanes and choked nullahs. The councillor steps in quickly with his promises but people have their doubts. “This is not even election time. Officials survey the area, make empty promises and go home,” says Ghulam Bakar, who runs a welding workshop in M block. In a while everyone heads home. The sabha is over. 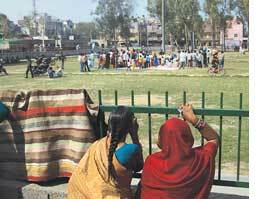 Mohalla sabha, which is a general body meeting of the residents of an area, was an experiment started by Swaraj Abhiyan, an initiative spearheaded by Arvind Kejriwal, founder member of the RTI movement and a Magsaysay awardee. Following the concept of gram sabha, the Abhiyan’s project came about as an effort to increase public participation in development works. 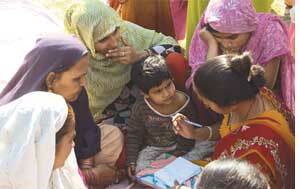 Non-profits organizing these sabhas term it a silent revolution. The first sabha was conducted in Februray 2009 in Trilokpuri. The model was then duplicated in Sundarnagri in June. Parivartan is in talks with RK Puram now. For a Mohalla sabha to happen, each ward is divided into 10 mohallas. Every household of the mohalla is sent a written notice of the meeting in advance informing them about the date, time and venue of the meeting that happens every two months. For this, the councillor writes a personal letter to each of the 40,000 voters in every ward. With the help of these sabhas, any community member can demand implementation of public works. But the chaotic manner in which it was conducted raises questions about its effectiveness. “If you had been to the sabha at M block two months ago, it was worse. But we learnt from that experience,” Santosh assures. Ramashrya, another member of Parivartan, said the Municipal Corporation of Delhi (MCD) gets crores of rupees for development, most of which remains unused because officials sitting in their AC offices do not know where the problem lies. “Through mohalla sabhas we ensure that funds are used appropriately. For the first time officers are coming out of their chambers to stand alongside people in the scorching heat to listen to their grievances and work accordingly,” she said. “It attempts to inform people about various government schemes,” said the councillor Santosh Kumar who can also, all said and done, look forward to being voted a second time. On his part councillor Kumar said, “I request them to come and if they do not show up, I write to the deputy governor asking him to take necessary action in public interest.” During the sabha, the demands are taken down as minutes of the meeting and funds are sanctioned on the spot by the councillor. If the number of proposals received is more than the funds available, the demand that must get priority is put on vote. Lists of those who are poor and deserve old age, handicapped or widow pensions are collectively decided and nominated by the people. These minutes are sent to every household as proof. As for the expenses of organizing the sabha, it is best to conduct it in some school which is available free of cost, says Santosh. The other arrangements such as hiring the sound system are managed by the non-profit. The councillor pays for the pamphlets as they are in his name, she adds. Mohalla sabha does not have any legal sanction yet. Decisions taken in it are not legally binding on anybody but Parivartan members are hopeful. “When more and more wards start having the sabhas, we can pressure the government to enact a law to recognize it. There is a long way to go, but the change has begun,” says Santosh.